9. 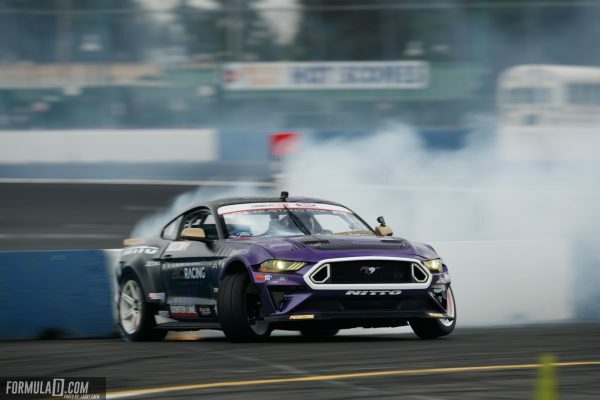 Has Justin Pawlak Become the New King of the Ford Mustang? 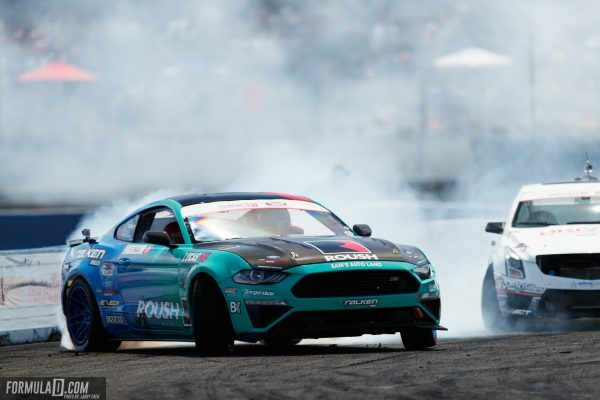 Justin Pawlak finds himself comfortably in 5th place in the Formula Drift championship putting him 125 points ahead of the next Mustang driver in the field (Chelsea DeNofa in 14th with 159). 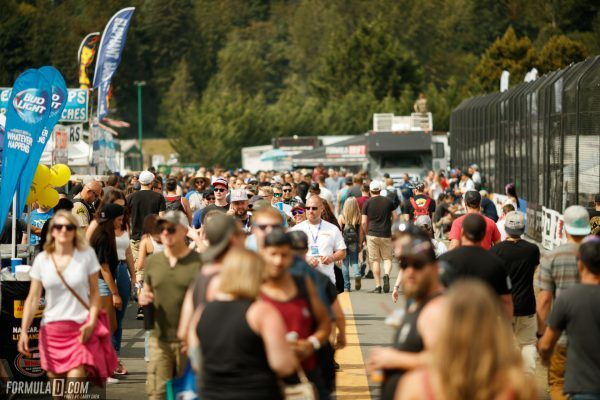 While Justin isn’t likely the first driver you think of in the Formula Drift paddock when you hear Ford Mustang driver,, he is the one who of this group that is really performing on the track. He could easily land a top 3 championship spot this season depending on how he finishes up. The Cameron Moore versus Jhonnattan Castro battle was actually one of my favorites of the weekend. 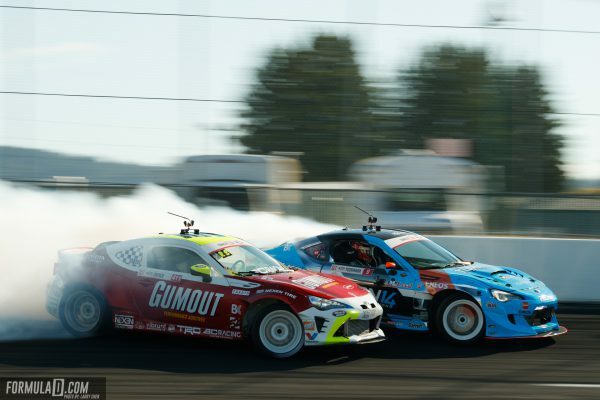 It was a very well balanced battle between two guys in the same chassis with different motor setups. While it wasn’t the blockbuster battle of the season, it was nice watching two guys really duke it out in what ended up as a 2 OMT battle. The second OMT was crazy because both drivers spun as they were pushing so hard to win. I think at any other track Castro might have edged out Moore. 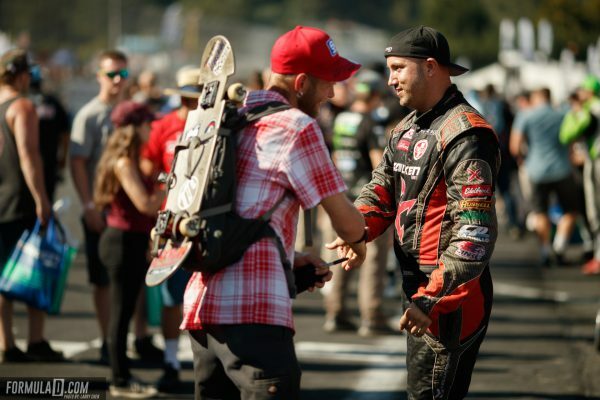 Cameron Moore ended up looking much more comfortable at his local track of Evergreen Speedway than we have seen him at other venues around the country giving him a small edged that pushed him into Top 16. Racing is something that always comes down to the smallest of margins and this one really hurts the Chris Forsberg Racing team. A Top 32 exit in a battle versus Matt Coffman slung Chris Forsberg 124 points behind James Deane. After a season with mechanical issues plaguing the team,, this one must really hurt deep. You would think after winning his first event in 1,485 days in Orlando he was going to push his momentum to challenge Deane but that has stalled out. Forsberg and team will need a really good St. Louis performance to get back in the championship chase. Jeff Jones was in rare form this weekend at Seattle. He was feeling good and you could just see it and hear it in his voice. From doing Fortnite dances in the back of Matt Field’s interview, to his pure gold interview with Laurette Nicoll, he was having a great time. He even backed that confidence up on the track in his Nissan 370z by defeating former champion Michael Essa in the Top 32 and giving Piotr Wiecek a decent run for his money in Top 16. He got a big monkey off his back by making it to the Top 16 at Evergreen Speedway for the first time. His team had serious subframe cracking issues all weekend making his accomplishments even more impressive. Ryan Tuerck tends to have these unique moments when his car is working right and he looks like the drifting destroyer we all remember him to be from his Nissan 240sx days. You tend to see it early in the event when all is going right for him and coming together. His last podium was last season in Long Beach and that was another time when everything was plugging away for him and his Toyota 86. He couldn’t manage to take it all the way and lost to James Deane for the fourth time in a row (0-4 all time record) and will clearly be looking for revenge against Deane before this season is over. 4. Do car issues come from midseason wear or rough New Jersey conditions? So many teams struggled with serious vehicle malfunctions this weekend it made me wonder is Wall Speedway in New Jersey that rough of a track or is the mid-season taking its toll on teams and vehicles? Forrest Wang suffered an engine failure that prevented him from even qualifying over the weekend and he is a driver who always seems to make it into the big show no matter what. Forsberg and his throttle bodies, Jones and his subframe, and the list could go on and on. I think the fault lies in both issues, but I am going to pay more attention to events post Wall in the future season to see if the aftermath is teams having more car issues. That chase run against Alex Heilbrunn is the Top 16 (roughly 4 hour 50 minute mark on the Main Event live video) was the chase battle of the weekend. Chelsea DeNofa is likely the best chase driver in the Formula Drift series at this point. He just needs to partner his wild and aggressive chase style with some better lead runs and qualifying pulls and he could be the Championship contender everyone has always felt he could be. It’s a bummer he blew his lead run against Heilbrunn because I would have loved to see that chase against Wiecek in the Great 8. 2. Daigo Hints at a US Return on Facebook? Just after the event on Monday, Daigo Saito took to his Facebook fan page and posted this “またアメリカ走りたいな。懐かしい！” which Facebook roughly translated to “I’d like to run in America again. I miss it!” His post even included the “Call Me Maybe” video made by 1Kind back a few seasons ago. Daigo already made a huge arrival seasons ago with his SC430 and started the Horsepower Wars of Formula Drift that are still going on today. Perhaps, a 2019 return is in order and we could see him battle it out with the newly arrived Worthouse team for Drifting world supremacy and bragging rights. 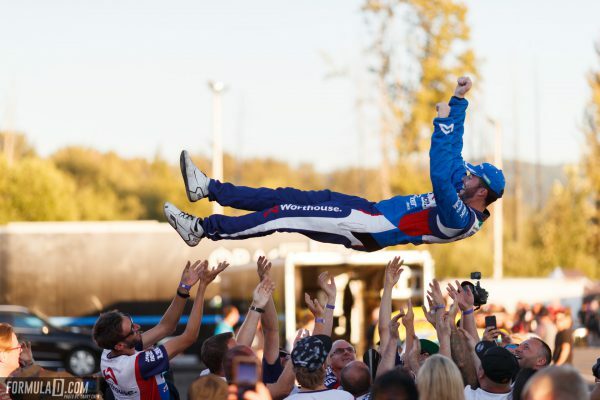 James Deane is already the ninth most winning driver in Formula Drift history after only competing in 17 Formula Drift events. He just finished a back-to-back victory session with New Jersey and Seattle putting him firmly 85 points ahead of Fredric Aasbo in the Championship Chase. 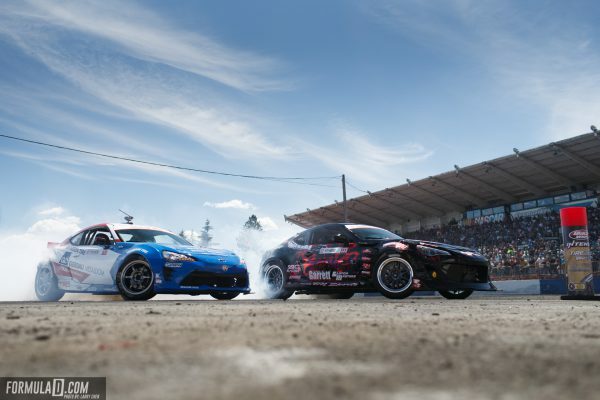 If James Deane can keep this level of performance up he will be just the second driver in history to win back to back championships following in the footsteps of drifting icon Tanner Foust who accomplished this feat in the 2007-2008 season.